"The professor of the course along with the assistants were always available, very helpful and quick to reply to the questions from the learners." 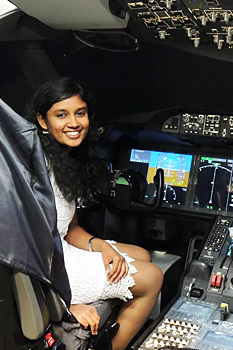 Lakshmi Rathina Sabbapathy is a flight mechanics engineer from India. In July 2016 she participated in the course Aircraft Performance: Physics and Simulation. What was your motivation for enrolling in this course? I have a bachelor’s degree in Electrical Engineering, and I did a Master specializing in Flight Dynamics, Stability and Flight Control. In the industry, my role as a flight mechanics engineer involves the analysis of the handling qualities of flight controls along with the performance of the aircraft. Having obtained a very good grade in the 'Aircraft Performance: Physics and Simulation' course, I can now undertake flight mechanics engineering roles which are more challenging. I can get involved in the sales and marketing of an aircraft, participate in flight tests to determine lowest safe take off speed for an aircraft etc. Also as a TU Delft alumna, it was very exciting to work with another department in the faculty. Now I am planning to take the Air Safety Investigation course by TU Delft too. The course was divided into theory and a simulation practical element which gave me a good opportunity to implement the knowledge I had gained. Also, after each video lecture, there are questions which give a clear numerical dimension to the material studied. For example, it showed how the various aircraft performance characteristics are affected by changes in aerodynamics or propulsion parameters of the aircraft. For me, the structure of the course per se makes it easier to explore more deeply and to not forget important/recurring concepts. This added to a thorough learning experience. There were also insightful interviews with a pilot and a surprise flight test video on board the TU Delft's research aircraft Cessna Citation II to best demonstrate a stability concept. The professor of the course along with the assistants were always available, very helpful and quick to reply to the questions from the learners. All these factors made the course an enjoyable one for me. The online learning environment for the course was also user friendly and intuitive to access its different parts. It was a very dedicated online environment due to the positive ambiance set by the professors and the enthusiasm of the learners. It was interesting to know the ideas, questions and different solutions to the same problem via forums and hangout sessions of the students from across the globe. "It was phenomenal and very enlightening. I learned many things about flight mechanics and physics behind various flight concepts." "The flexibility of doing the assignments at your own pace is ideal for everyone who also has a job or is living far from TU Delft." "The way the course was delivered, the style, the approach and especially the content completely matched the target." "The course helped me to evaluate Aircraft Performance in variety of operating conditions and with different constraints."